When I was a boy in west Texas the neighborhood children enjoyed playing chicken, usually with speeding shopping carts. Two children were pilots and two children were bombs. The pilots dutifully ran their bombs up to full speed, released them, and … CRASH. Ideally your shopping cart remained standing after the collision, in which case you won. Fortunately, two shopping carts crashing sounds much more painful than it actually was. But this newsletter isn’t about the antics of bored suburban kids. This month we look at a much more deadly game of chicken between Iran and Israel (and by proxy, the U.S.A.). Mirroring the escalating tensions, oil prices are up over 10% in the past five weeks. Higher oil and gasoline prices are already impairing our economic recovery. This newsletter will examine Behavioral Game Theory as it applies to Iran and Israel. What is the best strategy to deter a foe who may be crazy, short of war? We will then look at the current sentiment snapshot of news and social media as it relates to Oil, Iran and Israel, which reveals some surprises about global mood and where the fear is this week. The psychology behind Oil’s recent price rise reveals whether the rally is sustainable (hint: fear is rarely sustainable in the short-term). In addition to our usual haunts of New York and Los Angeles, we will be speaking in San Antonio, western Pennsylvania, a CFA webinar, and San Francisco in March – we’re look forward to catching up with our friends in those cities! In evaluating any tense situation, the first priority is to get grounded in the facts. Iran now has the capability to create weapons-grade uranium inside a bomb-proof mountain near Qom. (U.S. experts do not believe a weapon has yet been assembled nor is within a year of being so). Iran provides weapons and training to Hezbollah, who battled Israel in southern Lebanon in 2006 (with surprising success). As part of sanctions, Europe and the United States have stopped taking delivery of Iranian crude oil and have frozen Iranian central bank financial transactions. From Israel’s side it is clear that a covert process of sabotage and assassinations is occurring against Iran’s nuclear enrichment program. As far as rhetoric, there is more to consider like the public murals depicting bombing the United States. (but recall, statements are not facts, and are typically negotiating tactics or posturing for a secondary gain – think North Korea). Various members of Iran’s leadership have threatened to “wipe Israel off the map,” sponsor a second Holocaust, and make other unconscionably inflammatory statements. The Iranian leadership boasts that in response to a military strike against it it will close the strait of Hormuz to shipping (e.g., oil) traffic. Israeli government statements indicate that for existential reasons (and I'm not talking about Sartre) Israel won’t allow Iran to possess nuclear weapons. Israelis also indicate there is 3-4 months before Iran’s nuclear development will be too far along to stop with a military strike. Now for our specialty - the psychological context. Keep in mind that excessive fear is paranoia, and paranoia is one of the most powerful types of fears, bolstered by one’s own feeling of isolation and often leading to self-destruction (e.g., Othello). Paranoia is present to varying degrees in most people – given that 15% of prehistoric humans met a violent death at the hands of another human, paranoia was an adaptive trait on an individual level. As strange as it may sound, through the emotional defense mechanism of projective identification the paranoid often induce others to treat them harshly or suspiciously. Yet on a population level, group paranoia often leads to irrationality and atrocities against the feared others through this same process of projective identification. The Iranian revolution of 1979 overthrew a British and American “stooge” – a monarchy placed in power by the CIA and MI6 in 1953 by overthrowing a democratically elected Iranian Prime Minister. Iranians rightfully see themselves as past victims of American meddling, and the regime does not trust the U.S., Israel, or Britain. Iranian propagandists go so far as to portray Israelis, British, and Americans as sub-human, referring to them as “dogs” and “infidels.” Is the Iranian leadership paranoid about U.S. and Israeli intentions? From our perspective, of course. Might their paranoia drive them to develop the very nuclear bomb we are paranoid about them possessing? Yes, definitely, wouldn’t you want maximum deterrence against a proven enemy too? 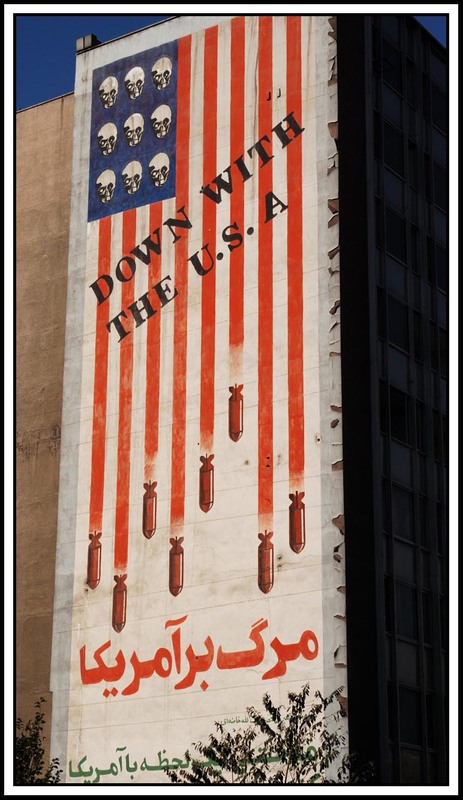 See the image above of a mural from outside the former American embassy in Tehran. One of the requirements in paranoid terrorist psychology is to dehumanize the opponent, so normal human empathy is turned off. Predictor of action: If you don’t see another as human, you can hurt them with no sense of remorse (in fact, you feel righteous to do so because you are protecting your group). Yet Israelis see an Iranian nuclear weapon as an existential threat (and the Iranian leadership has said as much). Given Israel’s history of near-annihilation on multiple occasions (not irrational paranoia), the military is not relaxed about this threat. Predictor of action: When backed into a corner, no option is off the table. In a startling twist of fate, the father of Game Theory involving multiple equilibria in noncooperative games was John Nash, subject of the Academy Award-winning move A Beautiful Mind. Nash is a mathematical genius who won the 1994 Nobel Prize in Economics for his contributions to the field. However, in his early 20s he developed paranoid schizophrenia and spent many years in institutions. During the U.S. debt ceiling stalement in July 2011, University of Washington Professor David P. Barash wrote an op-ed in the New York Times explaining the game theory behind the show-down over raising the debt ceiling. 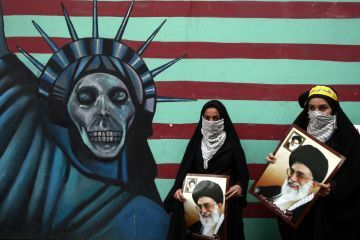 Many of his examples are illustrative of what the West is facing with Iran. In such cases of playing chicken, it is best to convince your opponent that either 1) you have no alternative course of action and so CANNOT compromise (“my constituents won’t let me back down”), or 2) you are stone-cold crazy and could care less about the consequences to yourself (“I will take you down with me if that’s how it has to be!”). Both of these strategies increase the negotiating power of a lesser player, but they also presume a rational analysis of the situation by that player. Sometimes your opponent truly is suicide-bomber-crazy, and you will always lose when playing chicken with such an opponent (as will they, but they won’t care). So how do you know whether your opponent is strategically crazy as in the first two cases or crazy-crazy like a suicide bomber? (See Dr. Barash’s article or book to learn more). In the case of Iran, the key question is, is the leadership acting strategically to increase their bargaining power, increase their esteem among their own people, and perhaps even earn the international perks and payoffs that North Korea (food aid, energy shipments) and Pakistan (military “aid” and free cash) have earned? This seems plausible enough, but before moving on, we need to determine if the leadership of Iran is truly crazy. Aside from a perhaps justified paranoia about foreign invasion, Ayatollah Khamenei and the Iranian leadership has excellent hygiene and don’t apparently speak to themselves in public. However, the leadership is generally comprised of lifelong religious scholars, and given the sometimes thin psychic line between communicating with Angels and believing the CIA is following you, this might actually be worrisome. But wait, the CIA is following them. In any case, what evidence is there for leadership insanity? None of which I am aware, although very clever people such as Stanford’s Robert Sapolsky have noted fascinating parallels. So the first preferred strategy when dealing with such an opponent is to politically and economically isolate the country (done). Given the history of paranoia and poor relations between Iran and the West, and the absence of a legitimate political alternative to Ayatollah Khamenei and the Grand Council, it’s likely that isolation will not bring down the Iranian government. If isolation doesn’t work – and how long will we wait? - then either ignoring Iran (e.g., North Korea and Cuba) or a military assault (nuclear sites bombed by Israel in Iraq and Syria) is likely. To prepare for a military assault, bolder internal attacks and discord-sowing are already occurring. Then the choice becomes to either 1) Ignore Iran’s nuclear program and hope for a Cold War-style stalemate, or 2) execute a series of focused military attacks to further delay the program. Given Israel’s existential angst and previous history of striking Syria and Iraq, military assault appears most likely. The only question is when. The spot Oil price is a good proxy for potential conflict between the Israel and Iran, as the Strait of Hormuz and oil facilities will presumably be threatened for some length of time. 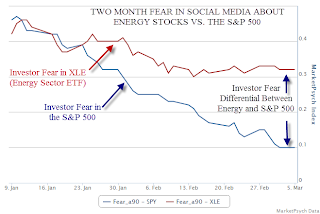 Since late January we’ve seen not only a climb in the oil price (and the stocks of energy companies), but also a divergence between the amount of fear expressed by energy stock investors versus S&P 500 stock investors. 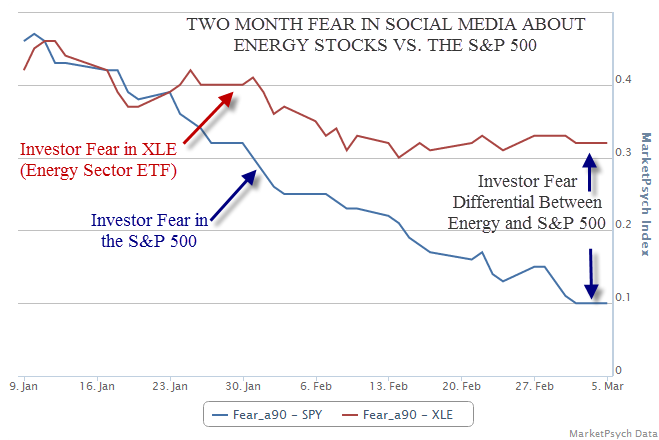 In this case, fear is good for the oil price and the profits of most energy companies. We also see high the levels of fear and pessimism in country-related messages in social and news media expressed about Iran and Israel. One difference we see in social and news media is a high levels of predictions of a higher oil price in social media, but only neutral predictions in the news. When higher prices are forecasted in conjunction with high fear, we usually see a price slide over a few weeks (although, the fear and price may rise again as the Israelis make more preparations for an assault). By the way, we’re also seeing high fear from investors in Copper, but in the case of copper, there is a good fundamental reason for fear, as China has ratcheted down growth projections. In such a case of fear with a rational basis, the price tends to continue a longer-term decline as the market gradually readjusts its expectations. Remember, the only way to prevent mistakes driven by fear is to be prepared. Run forward what would happen to your portfolio in case of an escalating war in the Middle East and a disruption to oil supplies (paired with a slowdown in the economy). If you’re a financial advisor it’s worth preparing what you’ll say to clients when they angrily ask, “why are we still in equities, everyone saw this attack coming? !” (Ask us for tips about communicating with clients). Energy traders would do well to stress test in case of an oil shock, including what if the limited war grows to include missles back and forth from Saudi to Iran and a broader Sunni-Shia conflict. And keep in mind that after the initial shock, war often leads to stock price appreciation as government spending spikes and the defense industry revs up. Discretionary managers may benefit from Trading Coach Richard Friesen’s Extreme Event Exercise – reply to this email with “Extreme” in the subject line to learn more. But all that being said, we truly hope for peace. Just remember to be prepared for the worst case (write down your plan), so you can go to sleep with one less potential train-wreck to ponder – we’ve had enough disasters to think about these past four years. We have speaking and training availability for your firm or organization in late April. Please contact Dr. Peterson or Dr. Murtha for more information.